Fishing for sharks in Key West with Dream Catcher Charters. February 27th 2017 – Its windy but the fishing is great and we do have sharks in the backcountry and on the flats. The forecast period has us looking at the winds being up through next week but clear skies and warm temps. 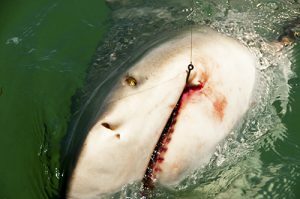 Shark fishing is really good in March for a few reasons..
During the bull shark spawn the lemon sharks do their thing as well. So that doubles the odds you will see some big boys cruising the flats like the bull shark in the shark video above. On our shark fishing charters we take you to some of the prettiest places that are infested with sharks. For the kids we have some amazing bonnet head shark fishing all up and down the Florida Keys and Key West. We call the bonnet head shark “bonefish practice” because of the fast unpredictable runs on light tackle..
Dream Catcher Charters — Signature — Key West Fishing Charter.. The Shallow Water Monsters Trip. Our shallow water monsters shark fishing charters are 4 and 6 hours long and can be incorporated with any other type of backcountry fishing charter at no additional cost. After we load the boat with some frozen starter bait. After short runs to our shark fishing grounds that take anywhere from 5 -20 minutes in our very fast bay boats. We start the day off with what we call the “circle of life” catching some jacks and blue runners to get the fresh blood going and some excellent bait fish for the sharks to come in on and attack. This is a great time to catch a bunch of fish and have some fun bending rods in the backcountry here off Key West. A warm up of sorts and it gives our captains time to get to know you and see what is going to trip your trigger. After we get caught up on bait we get set up on a flat or edge of a channel and let the magic start to happen. Chumming the flats with anything that bleeds we bring the sharks in from miles away. Often times, this time of the year the bigger sharks will have cobia cruising with them and we are ALWAYS ready for that fantastic opportunity for our anglers to catch a great food fish while shark fishing. Using Daiwa Saltiga Boat Rods and Saltiga lever drag reels we set the baits and wait for the sharks to come in and eat. We offer belts and proper technique advice on hook set and fighting to make sure you get the best chance possible to land your shark. Check out our shark fishing rates to learn about costs for this adventure and options.. Here is a Link To The Products We Use On Amazon For Shark Fishing in Key West.